I was pretty impressed with the short amount of time in the 2019 Mazda 3. But besides wondering when we’ll get the all-wheel drive hatchback with a manual, there was one huge question on my mind: “Where’s the ‘holy grail’ SkyActiv-X engine on this car?” So I asked around. During dinner on the final night of the 2019 Mazda 3 first drive event, Mazda executives and engineers entertained us with hints of the direction the company plans to take its compression engine technology, as well as ideas for diesel and, eventually, rotary engines. At the end of the two-day event, I was able to sit down next to Masahiro Moro, the President of Mazda North America, where he shared as much as he could about the upcoming generation of engine technologies the company has planned as part of its “Sustainable Zoom-Zoom 2030” plan. For the 2019 model year, at least in the U.S., the Mazda 3 is only available with the naturally-aspirated 2.5-liter SkyActiv-G inline four-cylinder engine. Driving it proved to be satisfying, but it’s understanding if you, like me, were a little upset we have to continue to wait for the SkyActiv-X. The Skyactiv-X engine works by using a process that Mazda calls Spark Controlled Compression Ignition—essentially a spark plug lighting off a localized rich mixture of fuel and air to create a fireball that compresses the lean mixture throughout the rest of the cylinder, yielding spontaneous ignition. It’s a fascinating concept that promises the efficiency of a diesel engine. While there’s no word on exactly when we’ll see the X engine make it into the new 3, Moro did clue us into what the hold-up could be about. 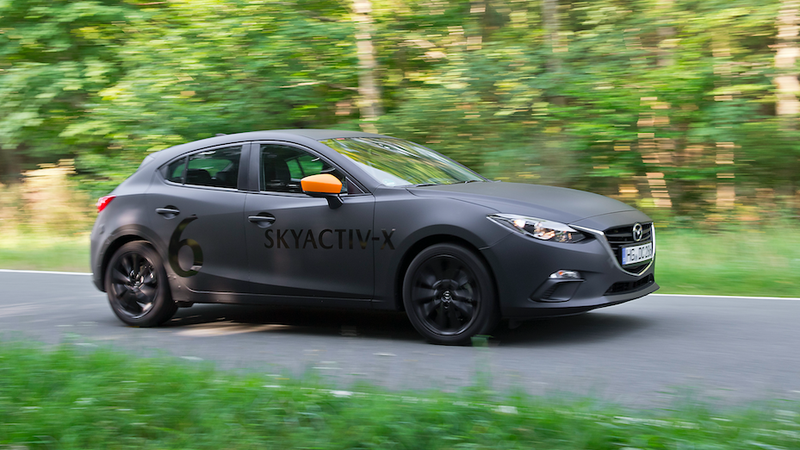 Mazda told Jalopnik the company is still exploring the SkyActiv-X technology for its full potential. As it stands, the initial excitement over the new technology was its improved and more reliable efficiency gains over the SkyActiv-G engines. But its efficiency in combustion also has the potential to produce more power compared to a normal gasoline engine of similar displacement. This could be where Mazda’s focus for the engine is at now. Moro mentioned that the company is fine-tuning the engine in preparation for production, and that he believes the engine needs to do more than just get better fuel efficiency, since gas prices are low and it would be tougher to market it on fuel savings alone. The suggestion is that Mazda is now working to tune as much performance out of the engine as possible, possibly even with turbocharging. When we previously drove a prototype back in September of 2017, the 2.0-liter SkyActiv-X could produce 187 horsepower—as much as the 2.5-liter SkyActiv-G engine in the 2019 Mazda 3. If Mazda can push that level of performance enhancement higher, then it has a new way of marketing its fancy new engine. Moro also briefly mentioned that Mazda sees SkyActiv-G and SkyActiv-X as only the first two iterations of its new internal combustion engine technology, but he didn’t elaborate on what SkyActiv-3 could be just yet. Moro only got so far as to say an update on Mazda’s diesel engines would be coming shortly, before he was carefully cut off by a media relations representative sitting across from me. We did talk, however, about the damage done to the image of diesel by companies like Volkswagen and Fiat Chrysler in the Dieselgate scandal. But Moro still believes there’s a place for diesel in the U.S. market, and in Europe, despite increasing pressure from governments overseas to go electric. Mazda does currently offer a 2.2-liter turbo diesel four-cylinder in the CX-5 crossover. But Moro specifically talked about the performance benefits of diesel when it came to torque, towing, and range. It’s unclear if plans include the existing SkyActiv-D 1.8-liter engine that Europe is getting, or if there’s something else coming. We’ll see what’s up “soon,” I guess. To be far, it was more like “SkyActiv-R?” With the question mark. In the media presentation earlier that day, Mazda did include “rotary engine range extender” in its multi-solution approach to facing the challenging balance of performance and efficiency in the future. We’ve also heard there’s a possibility Mazda could apply the Spark Controlled Compression Ignition technology to a rotary engine, which could be interesting. But it’s the first time I’ve personally heard it labeled such a way, and it was an exciting finale to a conversation we had about the new Toyota Supra. Moro says he wants Mazda to produce a new RX-7, especially now that Toyota has debuted the Supra. He doesn’t see it as another model that has to fit into the lineup in any particular way, or serve any sort of financial support for the company. He just wants it to exist, and to serve as the soul for the direction he sees Mazda headed. With the Supra, we talked about how it was almost disappointing that it will become the face of that brand, but it’s not Toyota’s engineering underneath the car (it’s BMW’s, in case you’ve been living under a rock). He said if Mazda were to do a modern poster car, it’d do something they could be proud of having on every magazine cover, every website and in every advertisement. As nice as that all sounds, Mazda seemingly has a long way to go before it’s prepared to execute a new RX-7. It was interesting that Moro was focused on the RX-7 though, leaving out the RX-8. I wonder, if such a car ever existed, if it would go RX-9, skip to RX-X, or go back to RX-7. Who cares, let’s just hope Moro is as charming at dinner with the financiers as he was with us. That’s who he has to convince. The 2019 Mazda 3 Will Start at $21,000. What Do You Want To Know About It?